Manufacturers of The Judge timers. 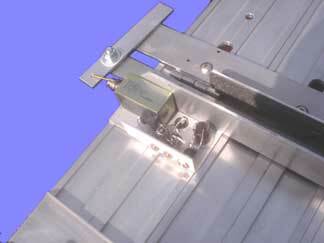 Also manufactures solenoid start gates and light trees. We have completely redesigned the remote controlled start gate mechanism for the aluminum Freedom Track. The new design does not require any modification to the track, and does not even require tools to install. (Ok, you will need a pair of pliers to make a quick adjustment to the .062" brass pull rod, and cut off the excess.) But the device itself is attached to the track with VHB tape. Simply peel off the wax paper and press in place. The Model LT3 Light Tree is on close out at only $50 while supplies last. The LT3 has been replaced by the smaller and much brighter LT4, which can easily be mounted to any track.